Removing a tortoise from the wild can severely affect local populations because they reproduce slowly in natural conditions. It is illegal to remove a tortoise from the wild. You can lawfully adopt a desert tortoise that has been displaced due to construction or raised in captivity through state-sanctioned adoption facility. Captive tortoises released into the wild can severely jeopardize local wild populations through the introduction of upper respiratory tract disease, which has been implicated in large tortoise die-offs in California. Also, captive tortoises released into the wild can displace or disrupt areas already occupied by tortoises. It is illegal to release captive tortoises into the wild. If you have a captive tortoise that you can no longer care for, contact your regional tortoise adoption facility. It is illegal to breed captive desert tortoises. The Arizona Game and Fish Department receives hundreds of captive-born tortoises each year. The Department spends a considerable amount of effort and resources finding homes for tortoises. This takes away time for conservation efforts of wild tortoises. Tortoises hatched in captivity cannot be released into the wild. Once in captivity, tortoises must be cared for by humans for the rest of their life. The Arizona Game and Fish Department Turtles Project utilizes technical equipment such as radio-telemetry tags, GPS units, and disease sampling gear to monitor tortoise populations statewide. By donating to the Turtles Project, you will help project biologists purchase this gear so that they may continue to plan and implement conservation and management. Download the Sponsor-a-Turtle program brochure. Using off-highway vehicles (OHVs) in unauthorized areas can result in loss and degradation of tortoise habitat. Please stay on roads and trails and do not trample vegetation. 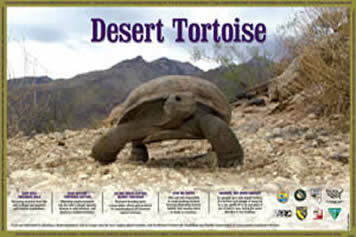 For more information on wild desert tortoises, email TurtlesProject@azgfd.gov.